At Poulsbo Animal Clinic, we take pride in using the latest technology to better understand your pet’s health. We offer a wide range of diagnostic services that allow us to gain a complete picture of your animal companion. From running blood samples in our in-house lab to viewing your pet’s organs in real-time, our mission is simple—to accurately diagnose your pet and start treatment in a timely manner. 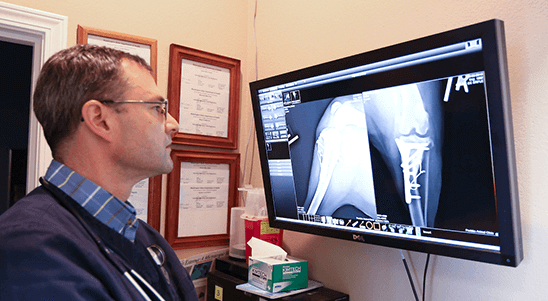 Commonly referred to as x-rays, digital radiology is an important diagnostic tool for veterinarians. Painless and non-invasive, digital radiology produces high-definition images of your pet’s heart, lungs, gastrointestinal tract, oral cavity, bones, and more. These images, called radiographs, help veterinarians quickly identify problems that may be missed on a routine exam, such as a decaying toothor a tumor. Ultrasound examinations are another important procedure used for diagnosing your pet. Non-invasive and pain-free, ultrasounds produce images using high-frequency sound waves which allow us to view your pet’s organs in real-time. This technology is useful in identifying many pathological conditions. At Poulsbo Animal Clinic, we use state-of-the-art ultrasound equipment and the latest ultrasound procedures. Ultrasounds are provided in-house through consultation with Dr. Steve Pokorny, a veterinary radiologist, allowing us to provide your pet with the very best in diagnostic care. Also known as an EKG or ECG, an electrocardiogram can be useful to monitor and manage the health of your pet’s cardiovascular system. During this diagnostic test, electrodes on your pet’s skin measure the electrical activity of the heart. This activity is measured in tracings of spikes and dips, which are called waves. Electrocardiograms allow our veterinarians to determine how well the heart is functioning and to monitor any arrhythmia. Poulsbo Animal Clinic is equipped with a modern ECG system, and all procedures are performed in-house with our experienced veterinary technicians. To ensure your pet receives the most accurate diagnosis, we partner with Dr. Jerry Woodfield, a veterinary cardiologist, who provides interpretations at our clinic. Diagnostic lab work is an important part of your pet’s overall care, allowing us to monitor changes or diagnose illness. At Poulsbo Animal Clinic, we use both our in-house laboratory and outside veterinary laboratories to accurately and efficiently manage your pet’s health. For specialized testing, Poulsbo Animal Clinic partners with reputable outside labs. These facilities can process lab work in a timely manner, ensuring that your pet receives the care he or she needs. Our friendly veterinary staff is happy to answer any questions or concerns you have regarding your pet’s health. Contact us today to learn more about our diagnostic services and how we can help your animal friend.